Oxygen depth profiling in Zn coated steel with CAMECA IMS 7f-Auto ion microprobe. Dynamic SIMS is widely used for the microcharacterization of metallurgical samples, thanks to its unique advantages: low detection limits for all species (H-U) including atmospheric species, possibility to use isotopic tracers, and capability to visualize their distribution in three dimensions. Hot-dip galvanization is a common process in steel industry: steel is coated with a zinc layer by immersing the metal in a bath of molten zinc (with a 0.3wt% Al amount) at 450°C. Coated steel surface may show undesired alternated bright and matt areas. In this study, dynamic SIMS depth profiling was used to investigate two different areas, bright and matt, of a Zn coated steel sample. Oxygen and Aluminum profiles are shown here. 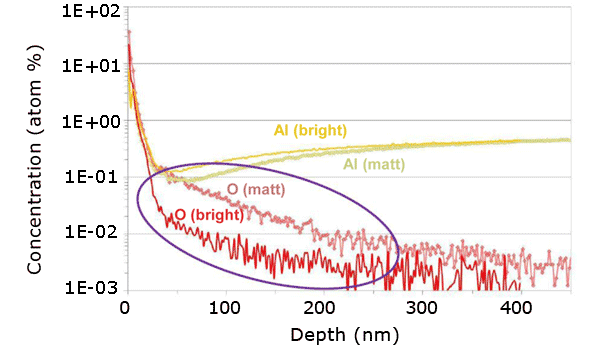 The O concentration over 30-200nm, corresponding to Oxygen segregated after solidification, is significantly higher on matt areas. SIMS contributed to the understanding of the formation of the matt areas (caused by the segregation of oxide particles during the coating cooling and solidification). The steel coating process could then be optimized, greatly improving galvanized steel surface visual appearance.